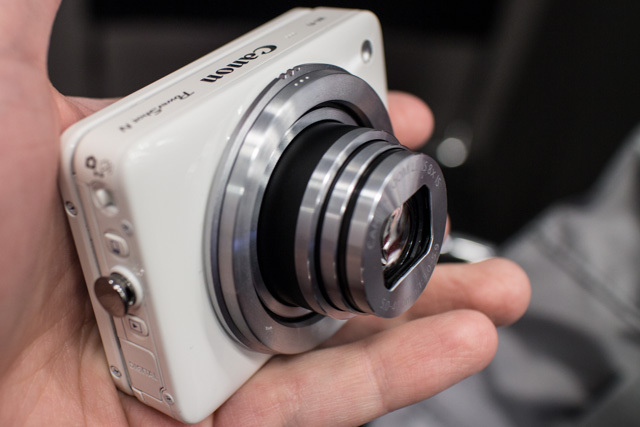 I had a chance to go hands-on with the new compact shooter at CES 2013 and learn a little more about how the camera works. 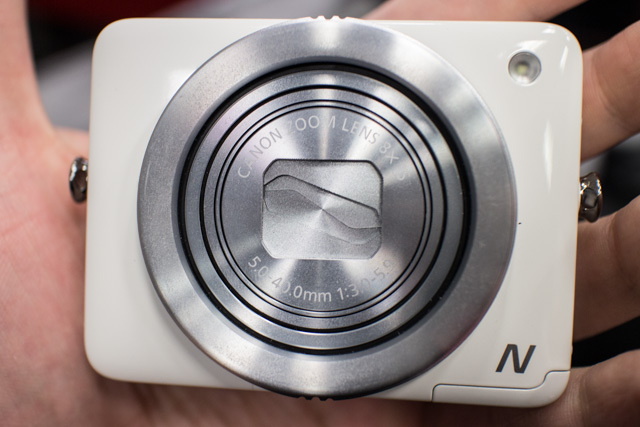 As noted above, the PowerShot N’s controls are unique and push boundaries that are nearly set in stone from a camera operation point of view. The compact N fits easily in the palm of your hand and there is no certain up or down to the camera – notwithstanding the written labels or tripod mount. 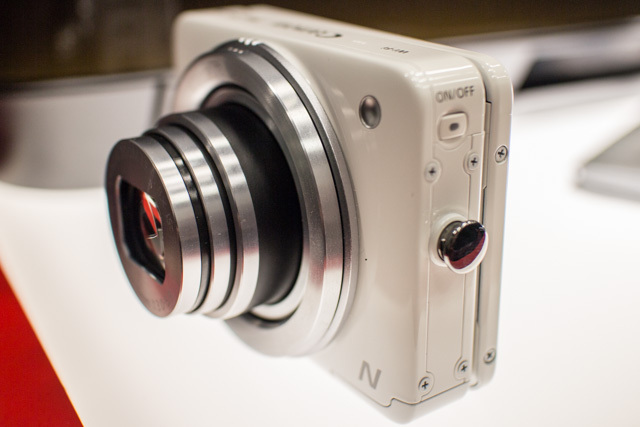 The camera can be operated normally when oriented upside down. The lens zoom is controlled by a larger outer ring that surrounds the lens. Likewise, the shutter is activated by pressing down on a ring that surrounds the lens. In my short time handling the camera, both actions felt rather awkward. In addition to the shutter “ring” on the camera, you can activate the shutter by touching the capacitive-touch LCD panel on the rear. This touchscreen LCD panel is one of the best that I’ve used on a camera – if not the very best. It has a very “iPhone” feel to it thanks to the capacitive operation. 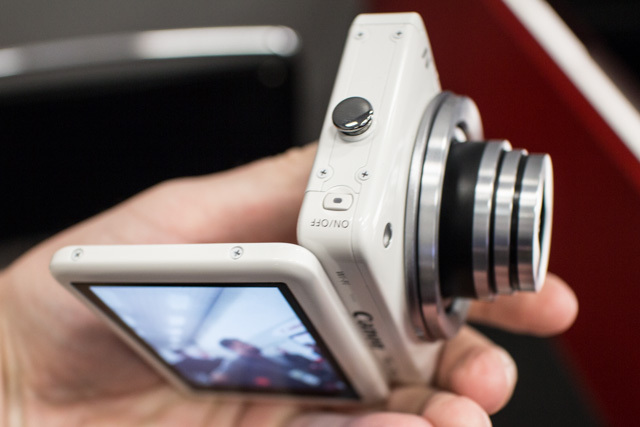 Canon really needs to put this tech into all of its cameras going forward. While I wanted to hold the camera with two hands for stabilization purposes, it is quite too small to handle with more than one hand. Add to that the location of the controls in the center of the camera body and it becomes rather cumbersome to literally get a grip. 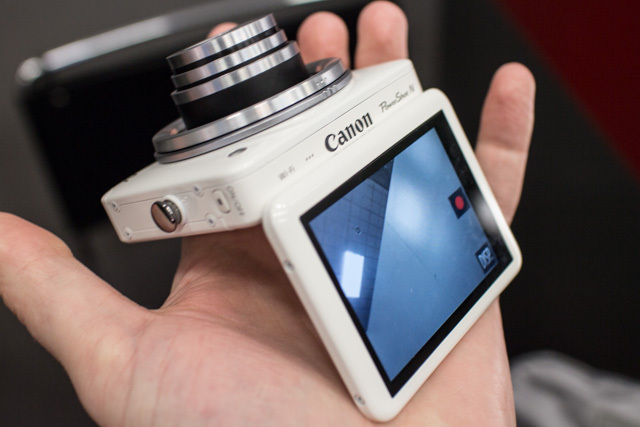 In the press briefing I was part of at CES, Canon reps continually referred to features on the camera as being design “for creative people.” I can’t quite take this marketing pitch seriously based on the supposed “creative” features highlighted in the camera. The biggest “creative” feature is the new Creative Shot mode, which takes 5 images in succession and changes certain variables in each shot – such as focus point, exposure, crop and other algorithmic variables. Again, Canon touted the “creative” nature of this feature; however, it just seemed a little to random to me to be useful in everyday captures. 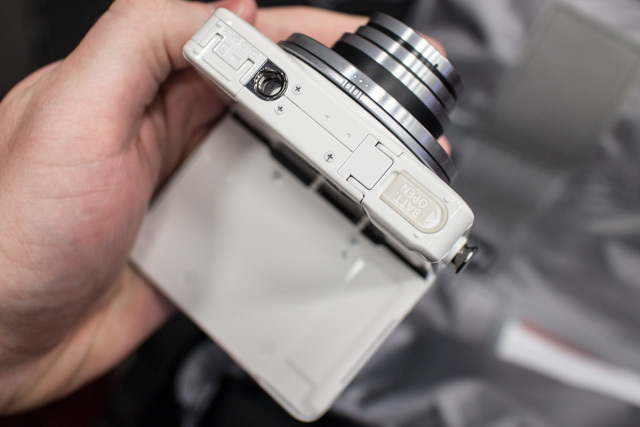 If anything, the randomness of Creative Shot mode takes the creativity out of the user’s hands and puts it into the algorithm of the camera’s firmware. Another bit of new tech in the PowerShot N is its wireless capabilities, which further blurs the line between the staple point and shoot and hybrid mobile device. 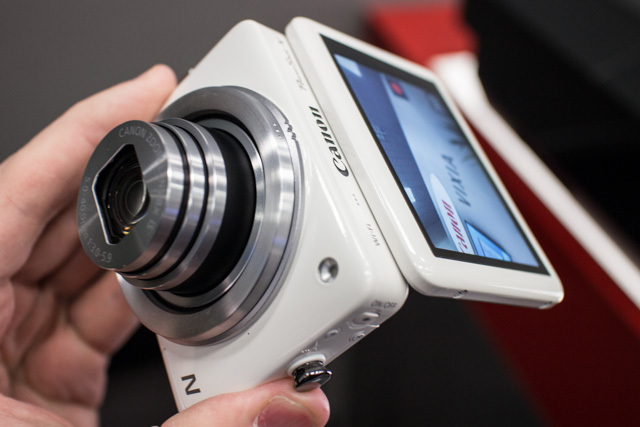 The PowerShot N sports a new Mobile Device Connect Button, which allows you to connect instantly to Canon’s free CameraWindow app for iOS and Android mobile devices. Once connected, you can wirelessly transfer photos and videos to the mobile device and then share them online through the phone or tablet’s online services. 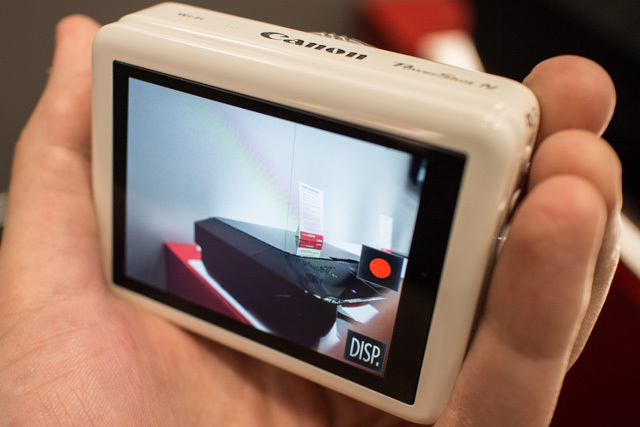 Given the ease of connection, this too is a feature that we need to see on all future Canon cameras (…perhaps instead of the Direct Print button?). While there are certainly some features that are a step in the right direction, the Canon PowerShot N fails to deliver on the “Wow!” factor for me. The awkward ergonomics and Creative Shot mode seem to be a pair of serious missteps. 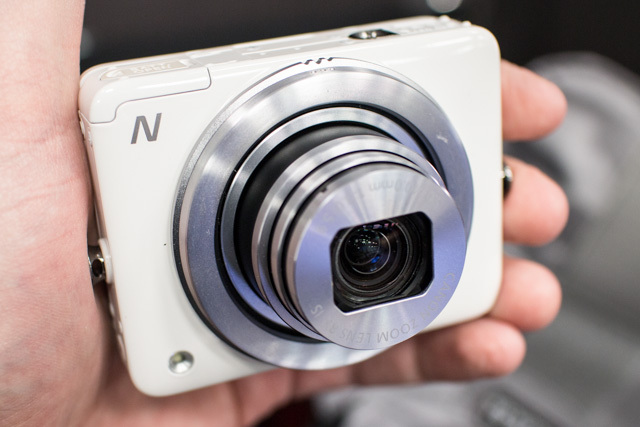 At $300, the PowerShot N doesn’t quite fit into the cheap pocket camera profile. And given that an iPhone will set you back $200 on a mobile plan that you’re already paying for, I can hardly see a reason to carry a second, awkward camera in my other pocket. But, then again, maybe I’m just not “creative” enough for this camera. 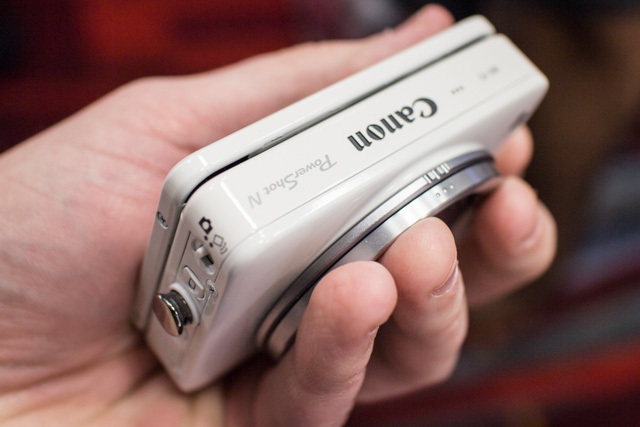 You can find the Canon PowerShot N at B&H Photo and Amazon.com.